Air generators, the technical name for pinwheel, divide into various categories according to: the Aeolian generator that can be either on horizontal or on vertical axis, the number of shovels (from one to three) and the lengths of shovels (from fifty centimetres to thirty meters). and a control system that manages the pinwheel functionality (and that, in overloaded or malfunctioning eventuality, blocks it); some air generators, generally the bigger ones, have also a system that provides a constant alignment between the rotor axis and the wind direction. The “Wind Farms” are real power stations: they originate from the connection of several air generators located within a fixed distance from each other in order to avoid dangerous interferences among them. Some Wind Farms, named Off-Shore, are located into the sea, near coasts and lakes; they are a valuable option also in densely populated countries. 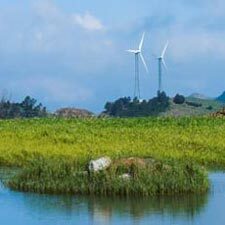 The history of wind plants in Italy is almost recent; the first air generator, installed in Sardinia, dates back to 1989; up to now we can say that the wind power use is considerably increased: the number of wind plants is raised up to around forty. birds can be killed while flying across shoves, even if this rarely happens; there is also the problem of interferences, and of the magnetic fields creation, but this can be avoided by using small expedients. To finish with, it is worth saying that wind power considerably reduces both gas and polluters emissions, which is on the contrary avoidable from normal power stations.